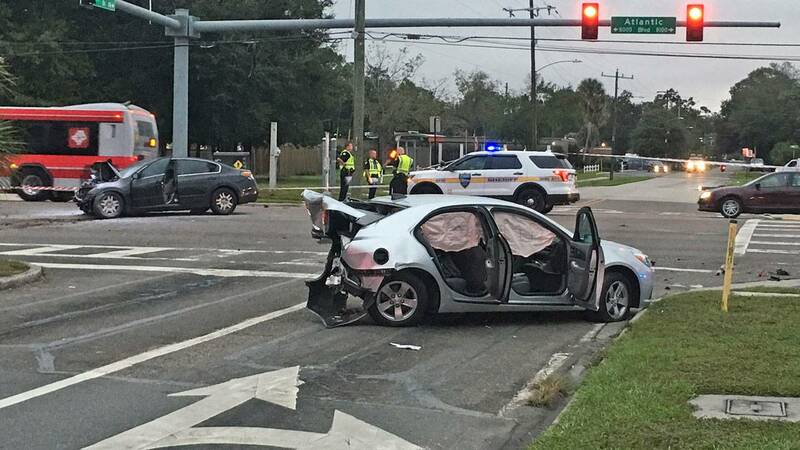 JACKSONVILLE, Fla. - One person had to be removed from a car after a pre-dawn crash Saturday at the intersection of Atlantic Boulevard and Acme Street, according to the Jacksonville Fire and Rescue Department. Crews called at 5:26 a.m. found at least one person was trapped inside a car and drivers of both cars hurt, one with life-threatening injuries. Police investigating the crash are getting witness statements and pulling surveillance video from neighboring businesses hoping to see what happened. Both eastbound lanes and one westbound lane of Atlantic were blocked through 8 a.m.